God is active among humans. To Mary, to Paul, to David, assurance of God’s presence is clear. We join them in awe and wonder, rejoicing that God continues to give birth to grace, hope, and new possibilities. * You too are favored. What extraordinary and grace-filled things have happened in your life? * Do you think Mary truly had a choice in responding to Gabriel’s announcement? Why or why not? * Many of us ask with Mary “how can this be?” How does questioning shape your faith? * These days of Christmas can be busy and stressful. How will you keep focused on Jesus’ birth? For the Week: Open my heart to receive your Son. Throughout the Day: Come now, Lord Jesus, come. 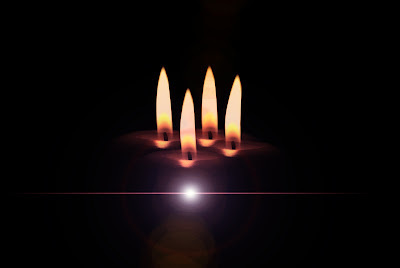 Devotional Practice: Light four candles and pray: We light the candles of Hope, of Peace, of Joy, and of Love. The coming Lord is forever faithful. Christ’s love for us is never-ending. We praise the God who cares deeply for all creation. May we always share the love of Christ. Christmas Season Ritual: The season of Christmas lasts 12 days – through Jan 5; find a way to celebrate each day. Try writing your own words to the 12 days of Christmas…start with Jesus in the manger and expand through all the characters and more… Or play “name that Christmas carol”- I can name it in 2 notes. Or play "Where is baby Jesus?" With others in different room, a person hides Jesus (from a nativity set, or a drawing) The seekers are guided by the hider with clues like “Mary is getting colder” or “Joey is getting warm”. The person who finds Jesus is next one to hide Jesus. Emmanuel, God-With-Us hears the cries of the poor and the sick. Do you know someone that is ill who would like a visit and would enjoy a plate of cookies, or lonely and would like to be invited to dinner? Donate a sleeping bag to the emergency homeless shelter. Take groceries to a food bank.